In 1992, USSR collapsed after the end of communist regime and independence of several states from Asian and European parts of USSR. USSR was a superpower before its dissolution due to which its collapse not only changed the political and economic condition in the areas directly related to USSR but it impacted heavily on global scale also. Following are important long and short term effects that were seen after collapse of the Soviet Union. Soon after the end of World War 2 in 1945, USA and USSR emerged as two superpowers that were leading two opposite economic systems, capitalism and communism respectively. Both had the intention to spread their respective economic system and influence in other parts of the world and it gave rise to hostility between the two superpowers. But both these superpowers had dangerous and lethal weapons (including nuclear weapons), and their direct conflict could be resulted in the destruction of the whole world. Therefore, both countries tried to spread their influence and stop the other to do so through cold war. Both formed various defensive alliances while Korean War, Cuban Missile Crisis, Vietnam War, conflict in the Middle East and Russian invasion of Afghanistan were few of the examples when these two powers tried to harm the other with their proxies. But the Russian invasion of Afghanistan proved disastrous for USSR. It exhausted the Soviet Union militarily and economically that resulted in the disintegration of USSR and its conversion to Russian Federation. After this, the cold war ended as the newly established Russian Federation was not capable to start any conflict with the West or even to protect its allies (e.g. Yugoslavia). Soviet Union was the unification of Russia and many of its semi-autonomous federations. But in reality, these federations, with non-Russian ethnic majority population, were under the strict control of USSR where people were not allowed to oppose the communist system and only the people of Communist party were allowed to rule these semi-autonomous areas. People of these areas were subjected to harsh treatment and several restrictions. They faced famines, tortures, forced migrations, religious restrictions and several other ill treatments but they were unable to gain freedom due to military might of USSR. But the situation changed after failed Russian invasion of Afghanistan as it depleted its financial reserves and ended the fear of its once considered undefeatable army. Now the USSR was also not in a position to keep these federations with it. 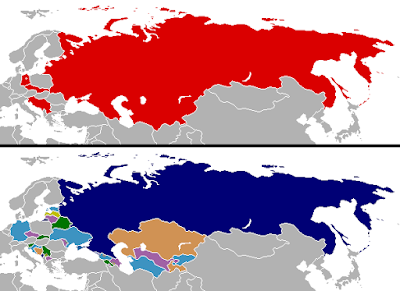 In the start of 1990s, all these 13 federations of Central Asia and eastern Europe voted for independence almost unanimously that resulted in the establishment of Ukraine, Belarus, Estonia, Latvia, Lithuania, Georgia, Armenia, Azerbaijan, Uzbekistan, Tajikistan, Kazakhstan, Kirgizstan and Turkmenistan. Apart from these federations, East and West Germany reunited again with the fall of Berlin Wall. The people of Bosnia, Croatia, Macedonia, Slovenia and others also gained independence after the breakage of Yugoslavia. Czechoslovakia also disintegrated in to Slovakia and Czech Republic and both countries also abolished communism. Modern Communism gained fame after the release of The Communist Manifesto in 1848 by German philosophers Karl Marx and Friedrich Engels. The ideology of communism was based on the poor social conditions of factory workers as they were exploited by their owners. The purpose of this movement was to nationalize the means of production and the distribution of money among people according to their needs that would eliminate social classes. Soviet Union became the first communist country after taking power in 1922. USSR adopted communism in the country and also tried to export communism in different parts of the world. But the famines in initial stage of communism and the worse economic conditions in USSR in its later stages turned people of different parts of the world, even Russia itself, against the communist system. People felt that expectations from communism are nothing more than beautiful dreams. Soon after the end of communism in USSR, the system also weakened in other parts of the world. Most of the former communist states abolished this system and now very few countries (China, Cuba, N. Korea etc.) have the communist system. After the fall of Soviet Union, there was no country so much powerful (militarily, economically and scientifically) that could replace USSR as the second superpower opposing USA. Due to this, USA became the only superpower remained on earth. It was later evident that US didn’t face severe opposition in its military conflicts (especially wars in Yugoslavia, Afghanistan and Iraq) due to absence of any other superpower.